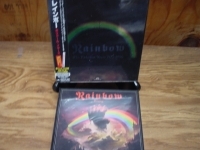 "Rainbow, The Polydor Years 1975-1986 - OBI Box Set - 9 Minis"
RAINBOW - THE POLYDOR YEARS - Japanese OBI MINI REPLICA LP TITLES making a 9 CD Box Set - ALSO COMES WITH THE BONUS BOX THAT IS SHOWN IN THE PICTURE. Japanese OBI MINI REPLICA BOX SET Japanese re-mastered Mini LP replica Limited Edition Collection Recorded from the finest Original Masters available. Each title Comes with anti-static sleeves similar to Vinyl LPs, Cardboard packaging exact to the original LP, Re-sealable plastic wrap cases for protection of each collectible and includes extensive Liner Notes Booklet. Actual miniaturized version of the 12" LP in 4" CD version Special VERY RARE LIMITED EDITION BOX SET ONLY PRODUCED ON FUTURES FOR THIS ONE TIME PRESSING -- were only available in Japan. RAINBOW THE POLYDOR YEARS 1975 - 1986 OBI BOX SET WITH THESE 9 TITLES - ALL Limited Edition Japanese pressings of this albums comes housed in a miniature LP sleeve RAINBOW RISING - Track Listings 1. Tarot Woman 2. Run With The Wolf 3. Starstruck 4. Do You Close Your Eyes 5. Stargazer 6. A Light In The Black FINAL VINYL - Track Listings Disc: 1 1. Spotlight Kid 2. I Surrender 3. Miss Mistreated 4. Street of Dreams 5. Jealous Lover 6. Can't Happen Here 7. Tearin' Out My Heart 8. Since You Been Gone 9. Bad Girl [#] Disc: 2 1. Difficult to Cure [Instrumental] 2. Stone Cold 3. Power 4. Man on the Silver Mountain 5. Long Live Rock 'N' Roll 6. Weiss Heim [Instrumental] BENT OUT OF SHAPE - Track Listings 1. Stranded 2. Can't Let You Go 3. Fool for the Night 4. Fire Dance 5. Anybody There 6. Desperate Heart 7. Street of Dreams 8. Drinking With the Devil 9. Snowman 10. Make Your Move DOWN TO EARTH - Track Listings 1. All Night Long 2. Eyes of the World 3. No Time to Lose 4. Makin' Love 5. Since You Been Gone 6. Love's No Friend 7. Danger Zone 8. Lost in Hollywood STRAIGHT BETWEEN THE EYES - Track Listings 1. Death Alley Driver 2. Stone Cold 3. Bring on the Night (Dream Chaser) 4. Tite Squeeze 5. Tearin' Out My Heart 6. Power 7. Miss Mistreated 8. Rock Fever 9. Eyes of Fire DIFFICULT TO CURE - Track Listings 1. I Surrender 2. Spotlight Kid 3. No Release 4. Magic 5. Vielleicht das Nachste Mal (Maybe Next Time) 6. Can't Happen Here 7. Freedom Fighter 8. Midtown Tunnel Vision 9. Difficult to Cure [Beethoven's Ninth] ON STAGE - Track Listings 1. Kill the King 2. Medley: Man on the Silver Mountain/Blues/Starstruck 3. Catch the Rainbow 4. Mistreated 5. Sixteenth Century Greensleeves 6. Still I'm Sad LONG LIVE ROCK N ROLL - Track Listings 1. Long Live Rock 'N' Roll 2. Lady of the Lake 3. L.A. Connection 4. Gates of Babylon 5. Kill the King 6. Shed (Subtle) 7. Sensitive to Light 8. Rainbow Eyes & RICHIE BLACKMORE'S RAINBOW - Track Listings 1. Man on the Silver Mountain 2. Self Portrait 3. Black Sheep of the Family 4. Catch the Rainbow 5. Snake Charmer 6. Temple of the King 7. If You Don't Like Rock 'N' Roll 8. Sixteenth Century Greensleeves 9. Still I'm Sad These are Japanese digitally re-mastered Mini LP replica CDs (the OBI Edition). This Limited Edition Collection has only VERY FEW made world-wide and are immediately Out of Print. Recorded from the finest Original Masters available. Comes with anti-static sleeves similar to Vinyl LPs, Cardboard packaging like an LP, includes extensive Liner Notes Booklet. Actual miniaturized version of the 12inch LP in 4inch CD version.